There was absolutely no "audible" music. Which can sound really strange to somebody who's never even heard of the concept of a Silent Disco. See, the Silent Disco company provided wireless headphones to everybody who came to the party. On these headphones, there's a volume knob, and a switch to choose between three channels. That means that up to three DJs or performances can play all at once, and the audience gets to choose who they listen to. Plus, it sure is nice to not have to talk over loud club music to chat with somebody - since you can just take your headphones off. The coolest thing about Silent Disco, is that the wireless LED headphones change colors depending on who you choose to listen to, which adds some awesome interactive and social elements to the party. In some aspects, it can be a "Battle of the DJs" because you can visually see who is winning over the crowd by looking around the room at everybody's wireless LED headphones. But it doesn't stop there - the interactivity of the headphones allows for so many creative ideas to come to fruition. As a music lover and event producer, this concept had me hooked immediately. It wasn't until a year later that I decided that I wanted to start my own Silent Disco Company, with a strong focus on Creative Event Production, and Silent Disco Equipment Rental. It seems to me that the possibilities of Silent Disco are endless! Since we first opened for business we have had the opportunity to work with so many creative people on some amazing events. - club nights, weddings, school dances and proms, corporate parties, music festivals, warehouse parties, 80s themed parties, elegant retreats, silent disco yoga, and so much more. And, being that we were a Production Company long before a Silent Disco Equipment Rental company - we are able to help our clients see their events come together full circle. Using Uplighting, and Moving Head LED Lights, Party Lighting, Tent Rentals, Dance Floor Lighting, LED walls, Monogram projections, & much more, we are able to offer a full production package to our clients that will blow away and leave a lasting memory with their audience for years to come. Also. with Silent Disco being completely contained in headphones event producers don't pay for sound permits and city sound ordinances for their events. In some cities, this can be a very involved process with strict cutoff times. 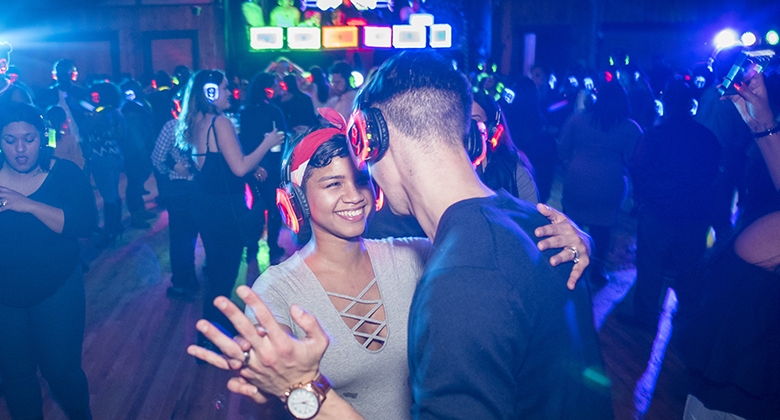 With Silent Disco, parties can rage on after-hours with no concern of breaking the city sound laws. Truth is, Silent DIsco is here to stay - and if you aren't involved I can definitely say you're missing out on something really special. Older PostSilent Disco Has People Talking.